Starting a custom t-shirt business is more than finding the right equipment. It’s also getting professional support and training so you’re business is running at its fullest potential. DigitalHeat FX knows a thing or two about running a successful t-shirt business and we pass on that knowledge to you. The first step is choosing the right printer. Click the Getting Started button to learn more about our products and service. Starting a custom t-shirt business is more than finding the right equipment. It also getting professional support and training so you’re business is running at its fullest potential. DigitalHeat FX knows a thing or two about running a successful t-shirt business and we pass on that knowledge to you. The first step is choosing the right printer. Click the Getting Started button to learn more about our products and service. Thank you for visiting our site where you can learn all about our amazing heat transfer solutions. Forever -Transfer Paper will Change for the Best! We know you will like what you see, so please give us a call at 855-348-4839 or Live Chat with a pro. Our DigitalHeatFX Full Color Digital Transfer Papers are unique. One paper-for-EVERY-application. Print your graphics once, then apply to cotton, polyester, lights, darks, noeprene, nylon, wood – all one paper, all the time. The right heat press can make all the difference for successful full-color digital T-shirt transfer printing. We have heat presses that will make a difference in profitability, longevity of the print, happiness of your customers plus save you time and money on wasted transfers. Wow, your customers with custom embroidered t-shirts along with custom printed tees. Custom embroidered goods can demand a higher price point for you, while giving your customers more options to choose from. Are You Tired Of Weeding Vinyl? Try Digital HeatFX™ Transfer Papers. 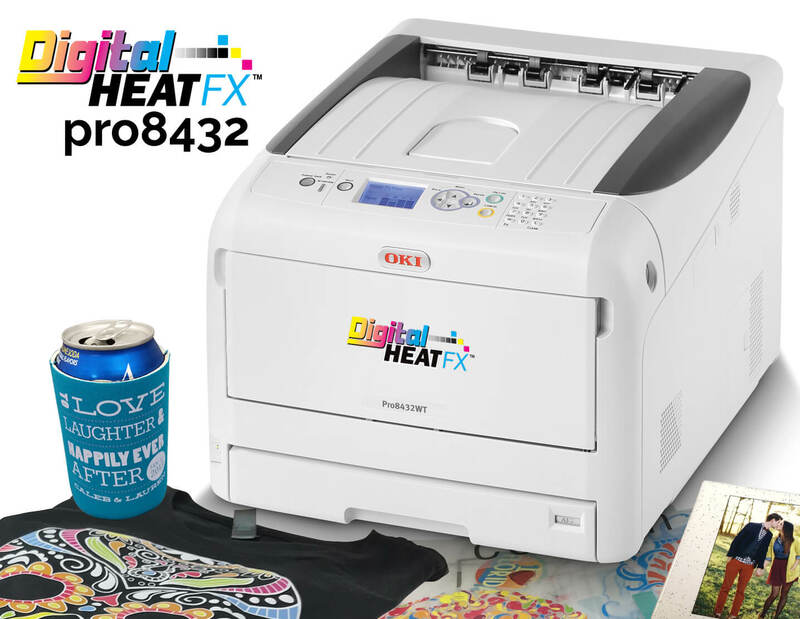 Digital HeatFX™ is proud to offer a no-cut, no-weed, no-background heat transfer process utilizing cutting edge transfer paper and white toner printer technologies. This innovative combination is able to produce heat transfers for both light and dark garments in a variety of fabrics as well as a wide range of other substrates including tote bags, hats, polypropylene, can coolers and more. Online Course – Learn at your own pace! What equipment you should buy with VIDEOS of how they work! Call 855-348-4839 to speak with a product specialist today.